Lofoten's four main islands of Austvågøy, Vestvågøy, Moskenesøy, and Flakstadøy, together with a number of smaller islands, lie so close together that from a distance, they resemble a single mountain range. Surrounded by countless rocky islets, the islands are indented by numerous inlets and fjords with towering rock walls of up to 1,005 meters. The mountains themselves, some as high as 1,266 meters, are alpine, with characteristic steep-sided, snow-capped summits. Lofoten's cliffs are perfect for nesting seabirds and other wildlife, while abundant marine life, such as migrating killer whales, provide another great reason to visit. Tourism makes a significant year-round contribution to the economy. 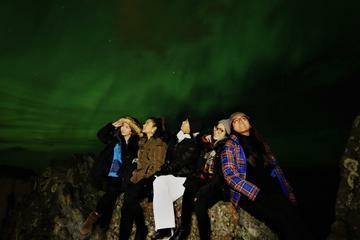 In summer, the secluded beaches and snug fishing harbors draw sightseers, kayakers, and campers, while in winter, seeing the fantastic northern lights and skiing are popular things to do. 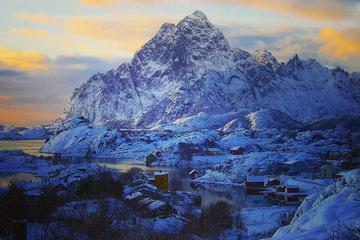 Despite being in the Arctic Circle, Lofoten experiences one of the world's largest elevated temperature variances relative to its latitude. Thanks to the Gulf Stream, this archipelago in Norway's Nordland region has mild winters and warm summers, with weather not as severe as other such northerly regions. Lofoten's largest town, Svolvaer, is located on the south coast of Austvågøy. Well served by ferries and cruise ships from the mainland and elsewhere, this town is an important fishing port and is where most people begin their Lofoten adventure. Svolvaer is a vibrant place, especially around the harbor with its many excellent cafés, bars, and restaurants. In addition to shops and galleries, the Lofoten War Museum is worth visiting for its collection of WWII-era uniforms and artifacts. If you're a climber, check out the Svolvær Goat, an unusual twin-peaked rock outcrop visible from the town offering incredible views for those brave enough to perform the famous "Svolvær Goat leap." Svolvaer is also home to Magic Ice, a unique space where Lofoten life is illustrated in ice sculptures, as well as the North Norwegian Artist's Centre, which has a continuously changing variety of artwork in varied media. From the straits of Raftsund, a narrow, rocky opening gives access to the Trollfjord, one of Lofoten's most popular tour boat excursions. Towering over the fjord is the snow-capped Higravtinder (1,191 meters) and the jagged Trolltinder (1,045 meters) mountains, rising above the Trollfjord, a 3.2-kilometer-long mountain lake, which is usually frozen over. Another popular day trip is by bus from Svolvðr to Stokmarknes and back by the express boat, which sails via the Trollfjord. Only 800 meters at its widest, it is quite the sight to watch cruise ships squeeze through during the summer months. Kabelvåg, a small fishing village on Austvågøy, is a great place to learn more about the importance of fishing in Lofoten. Start with the Lofoten Museum (Lofotmuseet) with its displays of life in the 1800s, including the history of fishing on the islands, a collection of Nordland-type boats and original fisherman's cabins. The Lofoten Aquarium is also worth a visit, offering a chance to learn more about the area's marine life, including fish and sea mammals from Lofoten. Finally, be sure to visit Vågan Church, the largest wooden church north of Trondheim. You could say all roads lead to Å, Lofoten's most westerly point. In addition to its spectacular views, this village on the island of Moskenesøy is home to the Norwegian Fishing Village Museum. Exhibits include a working forge and stone oven bakery, the typical home of a fisherman, and traditional boats, as well as a gift shop with locally made products, including cod liver oil produced right at the museum. Afterwards, visit the Lofoten Stockfish Museum dedicated to Lofoten's most famous, thousand-year-old export. Made from the plentiful cod that spawn around Lofoten's shallow waters, stockfish is everywhere on the islands, left to cure during the colder months on countless drying racks, and forming the basis for many of Lofoten's excellent fish dishes. Accessible only by boat, the remarkable Røst Islands, located about 99 kilometers from the mainland, are home to a large colony of seabirds, including some three million puffins. Thanks to their remoteness, the islands' high crags - Vedøy, Storfjell, Stavøy, and Nykan - are perfect homes for many rare species, such as the greater and lesser storm petrels and fulmars. All told, a quarter of Norway's seabird population lives on the islands, a fact that makes the trip by boat from Røstland all the more worthwhile. While there, visit the Skomvær Lighthouse, built in 1887 and considered Lofoten's final Atlantic outpost. The Lofotr Viking Museum at Bøstad on the island of Vestvågøy is a reconstruction of the 272 ft long chieftain's house that stood on the site around 500 AD. This excellent Viking adventure includes a superb short-film about the life of the chieftain and his family, as well as interpretive tours of the house and the numerous artifacts discovered on the site during archeological digs. Afterwards, walk down to the adjoining lake to see the replica Viking vessels, including an impressive longship. Often cited as the most beautiful village in Norway, Reine is a picturesque fishing community located on Moskenesøy. This popular tourist attraction has long been a favorite haunt of painters and climbers due to its spectacular fjord and mountain views. The high ground above the village offers superb views of the Moskenesstrømmen, a maelstrom described by Jules Verne and Edgar Allan Poe and considered one of the strongest such whirlpools in the world. For a close-up view of the maelstrom, take one of the many exciting boat trips through Moskenstraumen. For a truly unforgettable experience, treat yourself to a stay in one of Lofoten's iconic red fishing huts. Perched high above the tidal waters in countless fishing villages around Lofoten, many of these "rorbuer" (or "sjøhus") have been converted into accommodations perfect for use as a base to explore the area. Originally built to provide simple overnight shelter for fishermen, these wharf buildings, often two or three stories high, are now available for rent, from basic (a few bunks and a stove) to luxurious fully catered suites. Northern Norway's first glassblower, artist Åsvar Tangrand, began to create blown glass artwork and items that were inspired by the beautiful surrounding landscape of Vikten. Tangrand's work quickly became known throughout Norway for the techniques he developed and his trademark symbol "Lofotruna." The studio, named Glasshytta, is a quirky group of attached buildings, which are worth visiting even if you're not in the market for glassware. The studio is also home to a pottery workshop, as well as a cozy coffee shop, and visitors can tour the grounds. On the waterfront in Svolvær, the pet-friendly Lofoten Suite Hotel features gorgeous views of the islands and sea and it's only three minutes on foot from Magic Ice, a gallery with evocatively-lit ice sculptures. Amenities in the hotel include a hip restaurant, bakery, and cafe. The sleek and contemporary two-bedroom suites are great for families and longer stays, but note that the one-bedroom suites share a living area with guests in a bedroom on the other side. About eight minutes by car from Svolvær, in the town of Kabelvåg, the Lofoten Rorbusuiter offers delightful seaside apartments and cottages with fully-equipped kitchens. In Henningsvær, Lofoten Arctic Hotel offers two locations: The first is the Lofoten Arctic Hotel Skata right on the waterfront in a restored fish landing station. From the sparkling clean, compact rooms, you can gaze out at the beautiful islands and watch fishing boats ply the waters. A quick stroll over the bridge here takes you into the village. The second location is the Lofoten Arctic Hotel Knusarn, on Henningsvær town square, in a newly renovated building dating from 1892. Options for specialty lodging in Ballstad include the budget-priced Villa Ballstad, a large, bright house with a shared kitchen and bathrooms, and Solsiden Brygge, which are modern apartments in restored fisherman's cottages with views of the sea and crags. The Lofoten Islands in a Day: Those who only have a limited time in the area can see the highlights on a full-day guided tour of the Lofoten Islands. Operating in the summer months, when the light and temperature are more favorable, this small-group tour lasts five to six hours, exploring top attractions like the picturesque fishing villages of Kabelvåg and Henningsvær, Viking archaeological sites, and even the white beaches of Haukland. The Photographer's Dream: The varied landscapes and cultural heritage of the Lofoten Islands make it a popular subject for both professional and amateur photographers. The Summer Photography Tour of the Lofoten Archipelago lets you take the guesswork out of getting the right light in the right spot with the help of an expert, English-speaking guide. This small-group tour is limited to six participants to ensure that you get the most personalized tour, and the itinerary is flexible depending on your interests. Northern Lights and the Midnight Sun: The northernmost city in Norway, the city of Tromsø is an important fishing center, as well as a port for tourists who want to witness the stunning aurora borealis and explore other top tourist attractions. About 217 miles north of the Arctic Circle, visitors can experience the eerie midnight sun from May through mid-July. Tromsø is also located near the borders of both Sweden and Finland, where you can explore Swedish Lapland, home to Abisko National Park, as well as the Finnish Lapland. Norway's Biggest Fjords: Stretching into the mainland along the southwestern coast of Norway are its two largest fjords. The Sognefjord is the biggest, stretching 127 miles from Sygnefest to Skjolden, where it splinters into narrower inlets. To the south, just past the historic city of Bergen, is the country's next largest, Hardangerfjord. The Hardangerfjord area has been a top tourist destination since the second half of the 19th century, known for its glacial waterfalls. Urban Norway: Norway's largest city and one of the biggest capitals in the world, Oslo is known for its historic tourist attractions and things to do, from museums to music and theater. Trondheim, founded by Vikings in AD 997, is the country's second-largest city and conveniently located on the Hurtigruten ferry line, which connects with Bergen and other coastal cities via Trondheimsfjord. Stavanger is also a thriving metropolis, situated on the southwest coast of Norway and known for its annual music festivals and numerous museums.